A photo with your celebrity entertainer or big name speaker is a lasting treasure for your event guests. Of course, like much of everything else in the live events business, there's only one chance to get it right. Earlier in my career, I was on the road with many high-stakes principals. I would run as many as five event photo opps a week for anywhere from 20 to 200 people. Feedback from the event planners on site was always so positive - they appreciated the process I used which made the whole experience much more manageable for everyone concerned. It’s in that spirit that I thought I would share the details of this photo opportunity plan, which incorporates the best aspects I’ve seen used by the high-stakes figures whose staffs had honed this to a fine art. I hope this event planner advice is a useful addition to your event planning checklist. Plan for an appropriate amount of time and contract accordingly with the Principal. On average, plan for approximately 3-4 photos per minute*. The last thing you, and the Principal, want is for there to be guests left in line when it is time for the Principal to depart. Make note of any restrictions the Principal may have (i.e. no flash), to make sure your photographer comes with the right equipment. Ask your photographer to bring a backup camera to ensure there will be no problems should he/she encounter an equipment failure. Does your venue have a backdrop that will work well or will you have to bring one in? When considering solid color backdrops, choose a neutral color – navy blue and grey are excellent choices. If you are using flags, make sure they are displayed in the correct location. The flag should always be placed to the Principal’s right when facing the photographer or to the left of the Principal from the photographer’s perspective. Any other flag should be placed to the Principal’s left when facing the photographer or to the right of the Principal from the photographer’s perspective. For more information about flag etiquette, a good resource is: http://www.military.com/flag-day/us-flag-code.html. Before the Photo Opportunity begins, ask your photographer to take some test photos so you can make sure that the backdrop, lighting, and angle of the photo (waist up is best) is complimentary to both the Principal and your guests. 4. Arrange for enough staff members/volunteers (six is a great start) to run the Photo Opportunity efficiently. Please reference our diagram for staffing suggestions. Staff Assist #2 – Located towards the front of the line, this staff member can collect notecards if you are using them, ask guests to place their personal belongings* (name badges, purses, coats, conference materials, drinks, etc.) on the adjacent table, and helps with the flow of guests to Staff Assist #3. Staff Assist #3 – Gently “pushes” guests into the photo when the Principal is ready. If there will be more than one guest in the photo, this staff member will advise of any special instructions (i.e. for two guests in a photo, one guest will stand to the Principal’s right and one guest will stand to the Principal’s left). 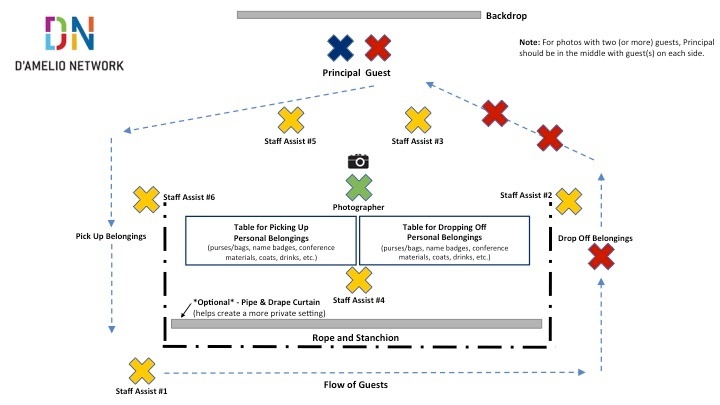 Staff Assist #4 – Helps move personal belongings from the “drop off” table to the “pick up” table so they are waiting for the guests after their photo. Staff Assist #5 – Gently “pulls” guests away from the Principal. Staff Assist #6 – Directs and reminds guests to pick up their belongings. 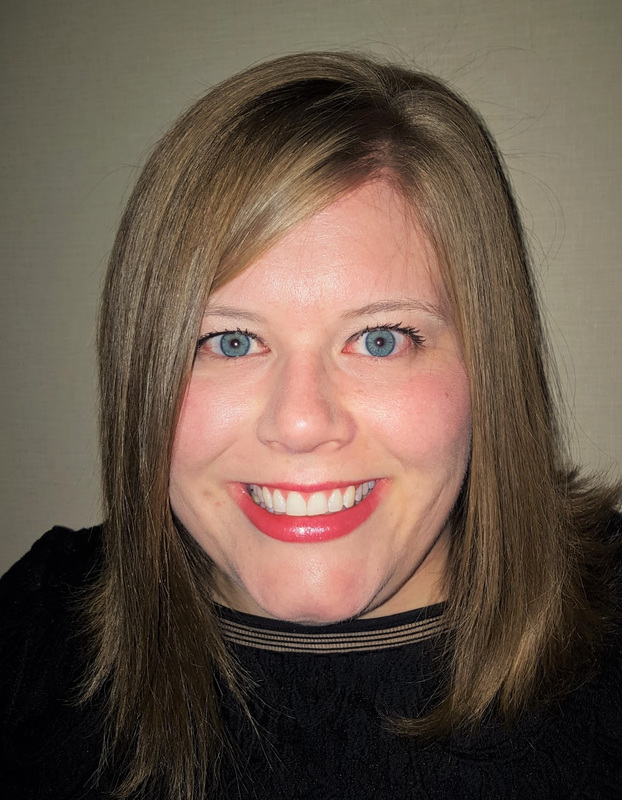 Jenny has over a decade of experience managing high-profile events for an impressive group of former government leaders, business executives, and media personalities. She spent over two years traveling extensively, both domestically and internationally, coordinating the speaking engagements for President George W. Bush after he left office in 2009. She now serves as Director of Operations for the D’Amelio Network.